A gorgeous cuddly white lamb in his little knitted jumper, packaged with some decadent handmade chocolates from The House of Chocolates. The baby tree, of your choice, will grow with baby for years to come. Beautifully boxed in our purpose-designed sustainable pine gift box. 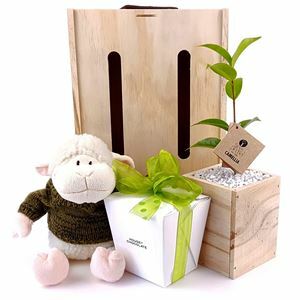 The baby tree of your choice (28 - 33cm high), potted in high quality potting mix so there is no rush for the recipient to re pot or plant. The softest White Lamb Toy wearing his little knitted jumper.